The Cleveland Indians were able to reach the playoffs for the first time in six years last season thanks in large part to their dominance over the Chicago White Sox. Cleveland looks to pick up where it left off Thursday night when it goes for a 15th straight win over Chicago, a streak that would tie the second longest in franchise history against one opponent. The Indians went 17-2 in the 2013 season series and six of their 14 consecutive wins came in September, when they went 21-6 overall en route to securing an AL wild-card berth. "They had our number. They outplayed us," White Sox manager Robin Ventura said after the final 2013 meeting, a 7-2 loss Sept. 25. "We had leads late, but they seemed to fight and come back. They had a few walk-offs." Danny Salazar earned the win in that game after allowing two runs and striking out eight over 5 1-3 innings, and he’ll make his second start of this season Thursday. The right-hander went 1-0 with a 2.00 ERA in two starts against the White Sox last year, striking out 17 over nine innings. He didn’t receive a decision Friday as Cleveland scored seven runs late in a 7-2 win over Minnesota. Salazar gave up both runs over 5 2-3 innings. He’ll be opposed by John Danks, who went 0-1 with a 6.30 ERA in two starts against Cleveland last season and is 4-9 with a 5.07 ERA in 18 career matchups. Jason Kipnis, Nick Swisher and Ryan Raburn are batting a combined .333 (22 for 66) with six homers against Danks. The left-hander is also making his second start of 2014 after not receiving a decision in Saturday’s 4-3 loss at Kansas City. He allowed three runs and five hits, walked four and struck out six in seven innings. 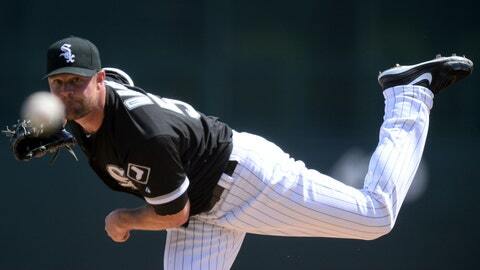 Danks threw 115 pitches, his most since having shoulder surgery in 2012. "Obviously four walks isn’t acceptable. But that’s something to build on, so I’m excited to go out there and have a decent game," Danks told the White Sox’s official website. "It was just easier to make the ball do something and throw it where I wanted to. It was fun." Cleveland, which has outscored the White Sox 102-45 during the 14-game winning streak, beat the Philadelphia Athletics 15 straight times July 6, 1943-May 21, 1944. The Indians’ longest win streak against one opponent is a 17-game run versus the Orioles from May 21-Sept. 6, 1954. Cleveland (5-4) enters this matchup after totaling three runs and 11 hits in splitting a doubleheader Wednesday against visiting San Diego. Chicago (4-5) was in a tie game at Colorado on Wednesday before the Rockies scored six times in the eighth to come away with a 10-4 win. Outfielder Avisail Garcia left after injuring his left shoulder on an unsuccessful attempt for a diving catch. Garcia went 4 for 5 and hit his first two homers of the season in Tuesday’s 15-3 win. The White Sox said X-rays were negative for a fracture or a separation, and Garcia is scheduled for an MRI on Thursday. "Right now I have pain," Garcia said. "Hopefully, it is just a strain."